The ATX 2.01 power extension cable lets you to extend the length of an ATX power supply connection. Designed and constructed to provide a dependable connection, the ATX24POWEXT is backed by StarTech.com’s lifetime warranty. 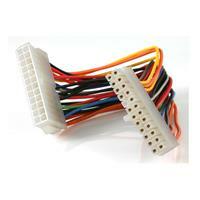 (5 stars) Great for creating custom ATX adapters!